As temperatures begin to plummet, more and more anglers are beginning to focus on targeting the striped ones. The run everyone has been waiting for is still yet to come, however you can expect to find some fish if putting in the time. Out on the beachfront, try throwing lures such as a bomber or storm shad, around jetties, pilings, and piers. Early mornings and evenings are generally the best times to go. For the bait fishermen, clams and fresh bunker will do. Will Thomas proved that putting in the time pays off when he caught a 46.5 lb striper off of the beach in Margate last Sunday (See Pic). He was using clam. 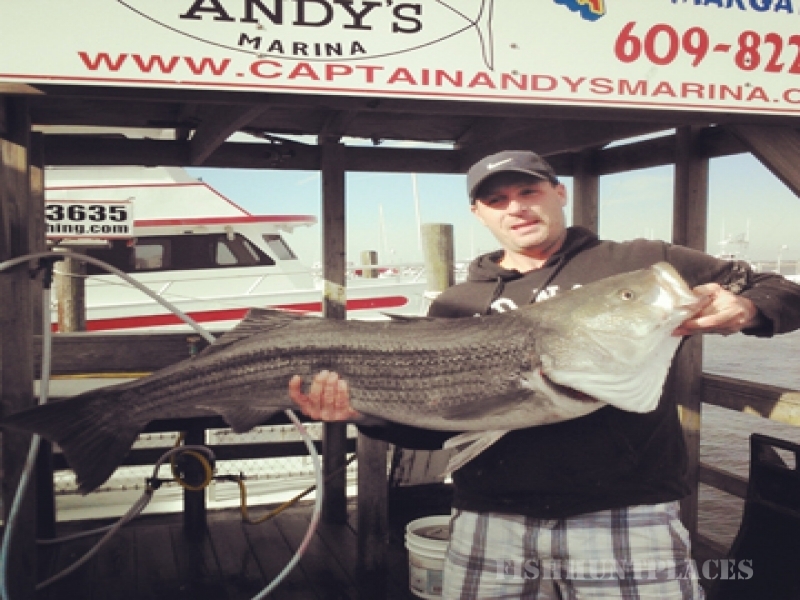 In the back bay, try drifting with live eels or spot to catch stripers. Bridges tend to hold fish as well as any place that you would usually find tog. Fishing the sod banks around high tide has still been producing fish as well for the topwater anglers. Try Tog fishing around structure such as Flag Island and the Seaview Harbor rocks. Green crabs will do the trick The keeper ratio is about 1 to every 8 fish. Stay tuned as we will be keeping you updated on the current fall fishing as the season progresses. The best is yet to come!